Monsoon at the coastal cities in India is extensive and relentless. Once it begins to rain, it pours! The last day of July saw 1469mm of rainfall in a single day which broke 63 year old record of sorts. But the lovely cool wet weather brings along with it an array of ailments and infections. We have had our share of flu and throat infections that kept us somewhat out of action. I have been unable to visit your lovely blogs. And what all posts that you have been seeing here were those that were pulled out from my draft folder. 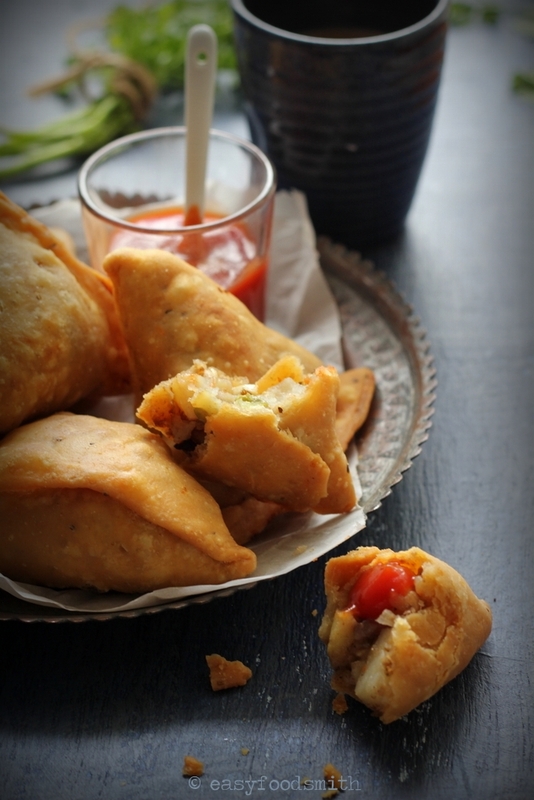 Samosa is one of the most popular savoury Indian street foods especially in the Northern India. It is on the menu of most parties and is loved by people across ages. The filling can be anything that fancies you – savoury or sweet. In the eastern state of Bengal the preferred form of filing is mixed vegetables whereas the North Indians prefer potatoes & peas or minced lamb & peas. The filling is absolutely a matter of personal preference. The sweet nutty chocolaty version posted earlier at EFS was a baked one unlike this one, which I have made the traditional way, i.e. deep fried. For the filling, take oil in a pan and add the onion, ginger and garlic. Fry till the onions become translucent. Add the dry masala and then the potato and the peas. Stir them together till they are well assimilated. Remove from heat and keep aside to cool. While the potatoes are cooling, start making the dough. Add carrom seeds and salt to the flour. Rub in the ghee to the flour. The flour should come together when you hold it in your fist. Now add the water and knead them together to make dough that is neither too hard nor too soft. (You may need to knead the dough for 2 minutes) Keep it aside for ½ an hour. Divide the dough in 4 equal parts and start rolling each (in batches) like a chapatti to approximately 2 mm thickness. Cut the rolled dough into two equal halves. Lift one half and bring together the round ends to make a broad cone. Hold the cone & using the flour paste seal the edges of the folded sides of cone. Now gently add the filling inside the cone, leaving half an inch on the top. Seal the top as well using the paste. Prepare the rest of the dough in a similar way and keep the prepped samosas on a greased plate. Pour the oil in a wok or a deep pan and let it heat gently on low flame. The oil should be warm and not hot when you add the samosas to it. Start adding samosas to it (fry them in batches) and continue to fry them on low flame till they turn golden brown all over. 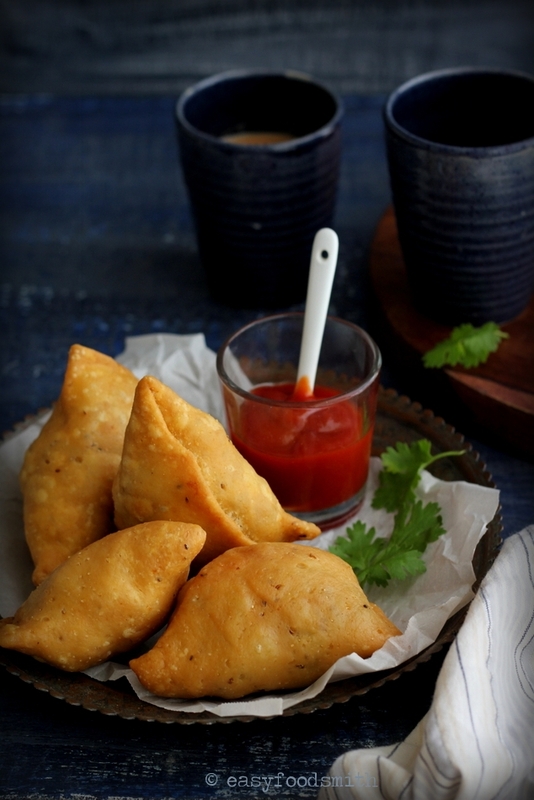 Patience is the key here; for crisp & flaky samosas that are thoroughly cooked, you need to fry them on low heat. It will seem to take a long time but the result is certainly rewarding. Drain on a kitchen towel or absorbent sheet. Note: You may add raisins and broken cashew nuts to the filling. We’re in a monsoon right now but it’s not near as fierce as yours. 1469 mm of rain is A LOT of rain! We’re lucky if we get 50 mm of rain in a day. That’s considered a lot of rain where I live. Looks like sprinkle to you. 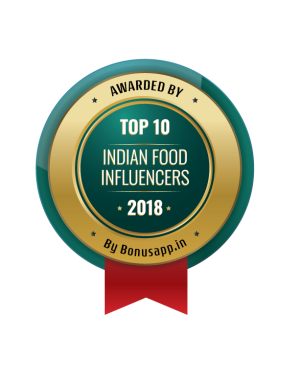 🙂 Oh the samosa – these are awesome! Look at that flaky crust. YUM! Wow! 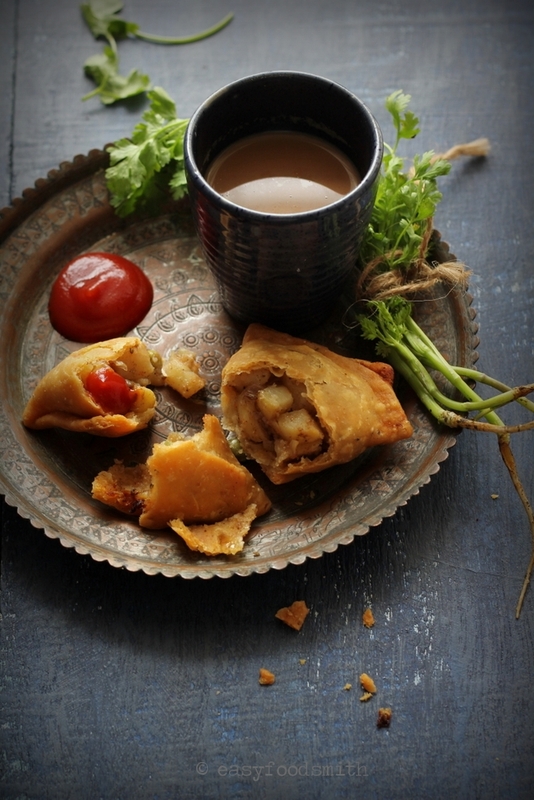 It is difficult to resist samosas especially during the monsoons ! Nice pics. Somaso’s looks perfect and yummy. All time favourite. Taruna ur pics have been tempting me since morning I must say by afternoon it started raining here too and that was the only excuse I too needed 🙂 Made samosas and imli chutney I can see my daughter wiping the plate clean as I type 🙂 could not take one pic 🙂 Thank you for inspiring. OMG! 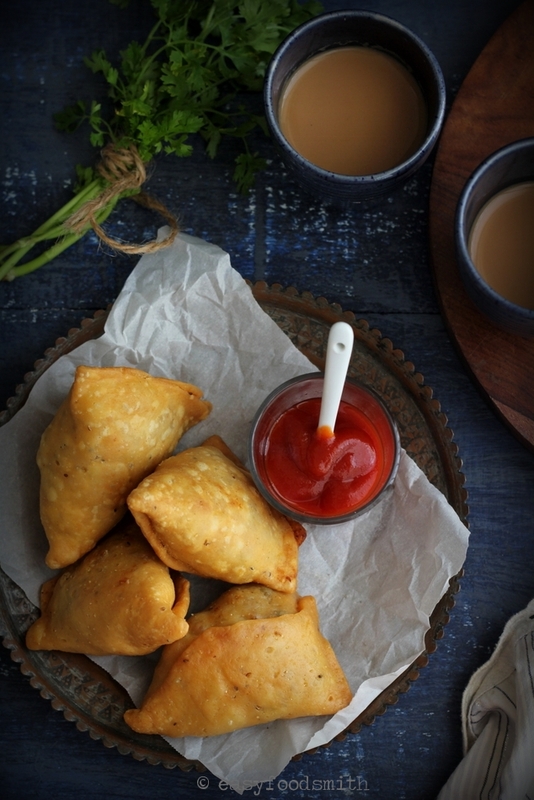 These samosas look so pretty, really puffed…beautifully done. Sorry about the flu. And the monsoon — that’s a lot of rain! Although I’ve eaten samosas loads of times, I’ve never made them. I really should — great recipe. Thanks. For the mean time I will be sharing and saving your samosa recipe because I need to try around a little more before I post my own. 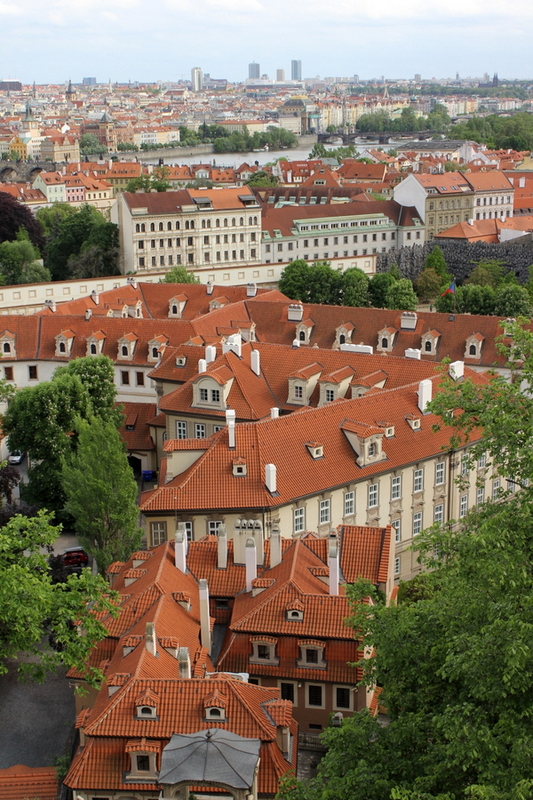 Thank you for sharing and take care! Wonderful snack for the monsoons!!! Wow that is a lot of rain, cannot even imagine. Stay safe and as healthy as possible. I think the samosa is the intro to most people for Indian food, was fr me. A good one is heaven, like yours. Wonderful, looking at these I remember I have few requests for gluten free samosa. Carbonated water?!? NO! C is short for Cup (i.e. measuring amount) just as tbsp is abbreviation for table spoon and tsp for tea spoon.